In yesterday’s “The Kidnapper-Senator Risa Hontiveros”, I explained how Senator Risa Hontiveros is criminally liable for violating, among others, the law against kidnapping and serious illegal detention. Save for the usual dilatory tactics associated with moneyed defendants, I expect a pretty speedy trial, as the elements of the crime can be very easily proven. But the ramifications of Hontiveros’ audacity extends beyond the confines of the courtroom, as her stupidest move yet come with blowbacks that her tiny brain was unable to foresee. But before we go to that, let’s first discuss the impeachment case against the embattled Comelec chair. Two impeachment cases have so far been filed against embattled Comelec Chair Andres “Andy” Bautista. The first one, from Atty. Oliver Lozano, will not go far because he’s basically a “serial nuisance filer”, as he has filed (usually frivolous) impeachment cases against every president since the 1990s [Star]. With that said, I doubt that there’d be a congressman willing to endorse it. The second one filed yesterday by Rep. Jacinto Paras and Atty. Ferdinand Topacio, however, was endorsed by House Deputy Speaker Gwen Garcia, Kabayan Party-list Rep. Harry Roque, and Rep. Abraham Tolentino of Cavite[CNN]. Yes, the second one is a go. Betrayal of Public Trust for failing to implement the Data Privacy Act of 2012 that led to the Comeleaks incident, the biggest data breach incident in history [NPC], where confidential information about tens of millions of voters were leaked for everyone to see. Betrayal of Public Trust for declining to assume direct control of the task force created after the Comeleaks incident. Betrayal of Public Trust for saying that the “ñ” modification is merely cosmetic in nature, effectively attempting to exonerate those responsible for it. Betrayal of Public Trust for filing incomplete SALNs. Bribery for receiving commissions from the Divina Law office. 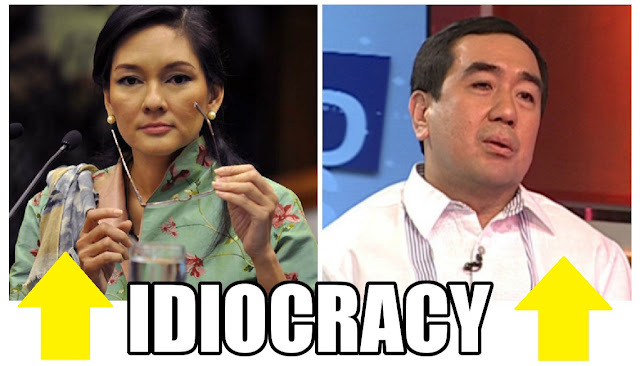 The third ground, meanwhile, has been extensively discussed in the 13 May 2016 article “BBM vs Leni: Comelec-Smartmatic gives Sec Abaya a run for his money”. The fourth ground, or betrayal of public trust when Bautista underdeclared his assets, is well-ensconced in the “Corona Doctrine”, as established when former Chief Justice was removed from office for committing pretty much the same offense. The fifth ground – bribery through the receipt of commissions from Divina Law – is a bit shaky. I have to see the actual complaint first to see if it has any chance of succeeding. Truth be told, I think that Congress may as well forget about the first, second, third, and fifth ground, as the fourth ground – SALN underdeclaration – is more than enough to convict Bautista. Surely, P 50 million in bank deposits declared in his SALN is way below the P330 million that Bautista’s wife Patricia discovered. And even if Bautista, by some accounting miracle, manages to escape that one, the undeclared real properties are also enough to kick him out. I have good reason to believe that the impeachment complaint will simply breeze through the House of Representatives. While some camps may argue that the supposed “supermajority” is mostly composed of political turncoats, we have to remember that a verified impeachment complaint need only gather the signatures of a third of the Lower House. That is, it’s pretty easy to get 100 signatures from the 290-or-so congressmen, especially since 121 of these congressmen belong to the administration’s PDP-Laban Party. With 100 signatures, an endorsement by the House Justice Committee would be unnecessary, and the articles of impeachment will be automatically transmitted to the Senate for trial. The question, however, is whether Andy will be convicted in a Senate impeachment trial, or not. Several hours after the endorsement of the impeachment complaint, the Comelec Commissioners released a resolution requesting Bautista to file a leave or resign [CNN]. The problem, however, is that Bautista cannot possibly do either. If Bautista files a leave of absence, the remaining commissioners can do whatever they want without Andy’s meddling: they can file a resolution that will finally ban Smartmatic from Philippine soil, or give some attention to Nelly Villafuerte’s 2013 complaint against Leni Robredo, or even conduct an internal investigation on Andy Bautista’s corruption and his alleged connivance with Divina Law. Meanwhile, If Bautista resigns, then he will lose his partial immunity from suit, exposing him to a barrage of graft cases that he will have to battle for the rest of his life. But like what I’ve said in a previous section, the Corona Doctrine virtually ensures impeachment in the Lower House and a conviction in the Senate for Bautista, so it appears that Andy has no way out. If I were Andy Bautista, I would use a three-pronged approach as a way out. First, I will cling onto my Comelec post no matter what. I will choose to remain Comelec chief until my term ends in February 2022, regardless of the public humiliation that’ll come with it. That way, I can maintain (1) partial immunity from suit and (2) significant control over the electoral process. This way, I can temporarily ward off lawsuits as I find ways to sabotage the 2019 and 2022 elections, ensuring the victory of “friendly” candidates. Most important among these candidates is the next president, who has the power of executive clemency, a power that Andy will really benefit from. Second, I will ensure acquittal at the Senate Impeachment Trial. I will probably be impeached in the Lower house, but the Senate impeachment trial is an entirely different ballgame. I can, for example, strike deals with friendly senators in exchange for an acquittal, or I can simply blackmail a few for the same effect. Third, I will minimize public backlash by going on a massive PR spree. I will spend like there’s no tomorrow to improve not only my own image, but also the image of the senators who will side with me. This similar to what I have been doing during these past several weeks, where I have appeared on TV shows left and right, in an attempt to deodorize my stinking reputation. Yes, the last PR spree was a failure because my brother Martin is so stupid [Transcript], but I’ll charge that to experience moving forward. I can also tap on my allies to aid in this effort. Take for example, family friend and former DOTC Usec. Rene “Timmy” Limcaoco, whose family owns and controls Luzon Development Bank, or the bank where I deposited my presumably ill-gotten wealth. Limcaoco’s wife Melissa is a co-founder of Hatchd Inc. [CV], one of Rappler’s major investors. Thus, I can ask the Limcaocos to force the financially ailing media company to write puff pieces about me or my would-be senator allies. All three prongs should work for the strategy to succeed, and I honestly think that Andy has the IQ and the US$ to make this work. Now, let’s see how the second prong can be implement in the Senate impeachment trial. Senator Leila de Lima is detained for drug-related charges and Senator Cayetano has resigned to head the Department of Foreign Affairs, reducing the roster of senators from 24 to 22. Now, a two-thirds majority vote is required for a conviction, so that having 22 senator-judges means 15 convict votes are required, i.e. 8 acquit votes is enough for Andy to avoid impeachment. The voting patterns will most likely be along party lines, similar to the pattern described in my 18 May 2016 article “Mark Villar thwarts LP’s Plan B”. The PDP-Laban Bloc (Ejercito, Pimentel, Zubiri, Pacquiao), or the ruling party. The Macho Bloc (Sotto, Lacson, Honasan), that owe Bautista nothing and who usually call a spade a spade. The NPC Bloc (Poe, Legarda, Gatchalian, Gordon, Sotto), that has a standing coalition with PDP-Laban. Nancy Binay, who hates LP’s guts after what LP did to her father Jojo. Nacionalista’s Cynthia Villar’s son Mark is a Duterte cabinet member, so she probably vote to convict. Angara is an independent administration ally [GMA]. Escudero, Villanueva, and Recto may need sweeteners, but I believe that they can be convinced to acquit Bautista. With 22 senator judges, 14 “convict” votes and 8 “acquit” votes, Bautista will remain in the Comelec. Andy’s problem, however, is that Senator Risa Hontiveros may have inadvertently ruined his strategy. My lawyer-friends and I are confident that prosecutors can easily find probable cause for charges of kidnapping with serious illegal detention against Hontiveros, especially since the parents of not one but BOTH of the underage witnesses are demanding custody of their children. And what comes after probable cause? A warrant of arrest and unfortunately for Hontiveros, kidnapping with serious illegal detention is a non-bailable offense [People vs Trestiza, G.R. No. 193833] so she can’t buy her way out of it. A conviction is not even necessary at this point: all that's needed is detention without bail. Thus, a kidnapping with serious illegal detention case, if filed against Hontiveros, will land her a spot in the PNP custodial center, beside incarcerated Senators Estrada, Revilla, and de Lima. And just like de Lima, detention will prevent her from participating in Bautista’s impeachment trial. With Hontiveros down, the total number of senator judges will be reduced from 22 to 21, so that a two-thirds majority will be reduced from 15 to just 14. But recalling the previous section, we already have 14 senators who will almost certainly vote to convict, right? Yes, Andy may still have seven allies, but with only 21 senator-judges, seven acquit votes are not enough: Andy will still get removed from office.